For guidance on selecting the right adhesive for medical device projects, check out 3M’s product selector tool: www.findmyadhesive.com. Understanding the science of skin can help design engineers select the right adhesives for medical devices. What do medication patches, diabetic monitors, infusion sets, over-the-counter bandages, and EKG monitors have in common? They’re all medical devices that stick to skin. And while they can provide life-sustaining and life-changing benefits, successfully adhering these devices to skin can be quite challenging. The above, in conjunction with age, environment, diet, culture, and overall health, create a unique combination for each person. Other daily routines, grooming habits, and hobbies – such as the use of lotions or powders and moisture from bathing or swimming – add additional wrinkles into the design mix. Even with these shifting nuances, adhering to skin isn’t impossible. The key to success is understanding the science of skin and how its characteristics interact with adhesive properties. Unlike a nice bottle of wine, our skin doesn’t get better with age. Each stage of life presents new advantages and/or challenges. As babies, our skin starts out fragile with fewer cell layers. Adolescence brings an increase in oil production and potentially the amount we sweat. The skin of healthy young adults is the most durable, but as we continue to age, our skin becomes drier, thinner, less elastic, and more fragile. Around the age of 55, our epidermis thins and skin loses hyaluronic acid, making it stiffer. These characteristics make it unrealistic to use the same adhesive and expect the same results across the age spectrum. This affects the type of adhesive a project requires. 2 Don’t overstay your welcome Skin can be fickle with how long it will let an object stick to it, especially if that object doesn’t allow skin to function normally. That’s why it’s important to select the right adhesive and backing to secure the device, along with the device’s housing material. All will help ensure the skin can breathe, flex, and move as needed for as long as the device is required to stay attached. It’s important to consider the desired wear time when selecting a stick-to-skin adhesive because over-designing could destroy a device’s success. For instance, don’t use an adhesive meant to stay on for two weeks if a device will be removed after five days. The adhesion will be at its maximum value at that time, making removal painful and possibly leading to a medical adhesive related skin injury, or MARSI (see sidebar, pg. 32). Even aggressive adhesives intended for long-term wear can experience loss of adhesion, edge lift, and eventual failure. Including a skirt – a border of tape extending beyond the footprint of the wearable device – can have a significant impact on the survivability of a device. In one case, a device exhibited 60% to 70% survival throughout 14 days without a skirt and 95% survival when the stick-to-skin tape included a 0.25" extension. Silicone adhesives, known for their gentleness and consistent adhesive strength, are typically suitable for wear up to five days and can be repositioned. Acrylics, on the other hand, intensify in adhesion after the first day or two of wear and can be optimized for longer term wear. Sticking devices to skin becomes much more challenging when they come into contact with moisture, but research on experimental tapes look to overcome this. In some recent studies, the tapes’ exposure to moisture was not limited, allowing participants to shower and exercise normally. Exposing experimental tapes to conditions similar to real world use, developers have pushed the boundaries of what’s expected from stick-to-skin technology. Learn more at https://goo.gl/sNCVxd. Just as not all skin is the same from person to person, not all skin is the same from location to location on the body, so don’t assume adhesives will perform the same way on different parts of the body. An adhesive securing a device to a healthy adult’s chest will have different requirements than one used on a baby’s face. If the location is fragile, using a silicone adhesive might be best. They’re a favorite for being gentle and causing less pain upon removal, as they don’t pull the skin or hair as much. If the location is more robust, acrylic tapes are often the way to go. The device’s location on the body is not the only important location to note. Keep in mind any special environmental conditions of the end user, such as a baby in a moist incubator, which might impact the needed adhesion requirements. Ever have a bandage fall off a cut less than a day after applying it? That’s your skin letting you know that the adhesive you stuck on it isn’t sufficiently breathable. The same thing will happen with wearable medical devices. The longevity of an adhesive adhering to skin depends on its breathability. Skin, if unable to breathe or release moisture for a length of time, will feel suffocated. If your project requires a device to stick to skin for more than a few hours, make sure both the adhesive layer and tape backing will allow the wearer’s skin to function as needed. Moisture vapor transmission rate (MVTR) is a function of adhesive and backing that lets engineers know how well the sweat generated underneath will escape. If it isn’t able to do so, sweat will accelerate the failure of the adhesive’s bond to skin. However, MVTRs typically reported for medical tapes aren’t applicable for tapes used beneath most wearables because these devices block moisture from passing directly through the tape in the Z-direction. Nonwoven backings allow some X-Y transmission of moisture, however, and tapes using them may perform better as they can help the moisture escape around the device. Breathability of the adhesive becomes particularly important in instances when the end user’s skin might become sweaty or wet. People who wear medical devices stay active and don’t want their device to impede those activities. These end-use applications make design engineers cringe, but adhesive manufacturers are working toward creating adhesives that maintain breathability and durability when wet (see sidebar). It’s a challenge, but sticking to skin doesn’t have to feel insurmountable. Engineers should engage adhesives experts with experience designing, testing, researching, and innovating adhesive technology and do so early to have the right support throughout the entire design and development process. Adhesives experts can counsel on the nuances of working with skin, discuss the best medical adhesive options, and provide critical analysis of a project’s needs. Better understanding the science of skin, and how new adhesive technologies can help make adhering devices to the skin more effective than before, will help produce a more successful product, a happier customer, and a more satisfied user. About the authors: Diana Eitzman, Ph.D., is director of agile commercialization for 3M’s Critical & Chronic Care Solutions Division and can be reached at dmeitzman1@mmm.com. Kris Godbey is an applications development specialist in the same 3M division and can be reached at kjgodbey1@mmm.com. 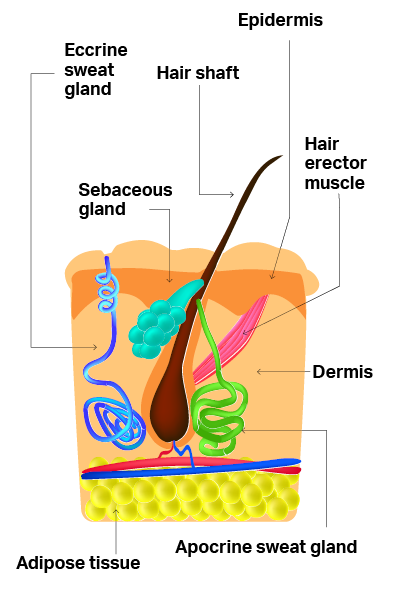 Skin tears, skin stripping, and tension blisters are common but avoidable examples of medical adhesive-related skin injury (MARSI). MARSI is damage to the skin that may occur when medical adhesives are not selected, applied, and/or removed properly. Learn more at https://engage.3m.com/ preventmarsi. Cambridge, Massachusetts – Researchers at MIT, Draper, and Brigham and Women's Hospital have designed an ingestible capsule that can be controlled using Bluetooth wireless technology. The capsule, customizable to deliver drugs, sense environmental conditions, or both, can reside in the stomach for at least one month, transmitting information and responding to instructions from a user's smartphone. Manufactured using 3D-printing technology, the capsules could be deployed to deliver drugs for a variety of diseases, particularly in cases where drugs must be taken over a long period of time. They could also be designed to sense infections, allergic reactions, or other events, and then release a drug in response. "Our system could provide closed-loop monitoring and treatment, whereby a signal can help guide the delivery of a drug or tuning the dose of a drug," says Giovanni Traverso, a visiting scientist in MIT's Department of Mechanical Engineering, where he will be joining the faculty in 2019. These devices could also be used to communicate with other wearable and implantable medical devices, which could pool information to be communicated to the patient's or doctor's smartphone. "We are excited about this demonstration of 3D printing and of how ingestible technologies can help people through novel devices that facilitate mobile health applications," says Robert Langer, the David H. Koch Institute Professor and a member of MIT's Koch Institute for Integrative Cancer Research. Langer and Traverso are the senior authors of the study, which appeared in the Dec. 13 issue of Advanced Materials Technologies. Yong Lin Kong, a former MIT postdoc who is now an assistant professor at the University of Utah, is the paper's lead author. For the past several years, Langer, Traverso, and colleagues have been working on a variety of ingestible sensors and drug delivery capsules, which they believe would be useful for long-term delivery of drugs that currently have to be injected. They could also help patients to maintain the strict dosing regimens required for patients with HIV or malaria. The device can also carry sensors that monitor the gastric environment and relay information via a wireless signal. In previous work, the researchers designed sensors that can detect vital signs such as heart rate and breathing rate. In this paper, they demonstrated that the capsule could be used to monitor temperature and relay that information directly to a smartphone within arm's length. "The limited connection range is a desirable security enhancement," Kong says. "The self-isolation of wireless signal strength within the user's physical space could shield the device from unwanted connections, providing a physical isolation for additional security and privacy protection." To manufacturing all the complex elements researchers decided to 3D print the capsules, allowing them to incorporate the various components carried by the capsules and build the capsule from alternating layers of stiff and flexible polymers, helping it withstand the acidic environment of the stomach. "Multi-material 3D printing is a highly versatile manufacturing technology that can create unique multicomponent architectures and functional devices, which cannot be fabricated with conventional manufacturing techniques," Kong says. "We can potentially create customized ingestible electronics where the gastric residence period can be tailored based on a specific medical application, which could lead to a personalized diagnostic and treatment that is widely accessible." "We're really excited about the potential for gastric resident electronics to serve as platforms for mobile health to help patients remotely," Traverso says. A complete knee replacement assembly: the femoral component, the tibial tray, and the bearing insert. A more flexible, standardized range generates tools for use in a variety of similar parts. Five major suppliers claim approximately 85% of the highly competitive orthopedic device and implant market, with more than 200 other companies vying for the remainder. In light of such intense competition, recent developments allow medical manufacturers to continually seek ways to machine components faster and more cost efficiently. Some of these innovations and strategies include dry coolant and 3D printing, along with advanced cutting tools and high-speed milling. Orthopedic components are typically machined from bar stock, castings, or forgings, then ground and polished. For hip and knee implants, the most common workpiece material is titanium, with the use of cobalt-chrome alloy increasing. A typical cobalt chrome alloy is similar to CoCr28Mo6, and the titanium alloy Ti6Al4V is most common. 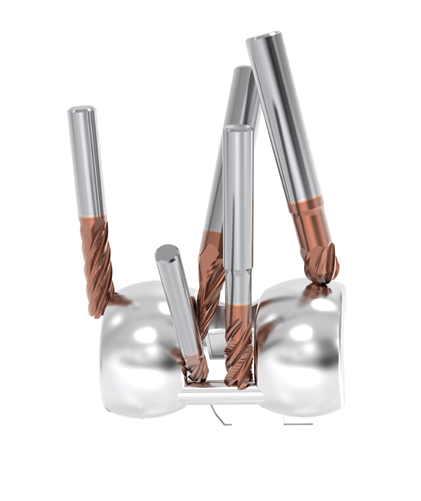 The JH770 end mill is engineered for roughing operations and is available in 4-, 5-, and 6-flute styles, enabling variations of the tool to rough from solid or perform near-net-shape operations. Because the materials used in orthopedic implants typically generate excessive heat when machined, coolant use is required. However, using traditional coolants is often prohibited or limited to prevent part contamination, where time-consuming and expensive post-machining cleaning processes are needed. In addition, coolant poses environmental issues for employee health, safety, and disposal. An alternative coolant technology uses supercritical carbon dioxide (scCO2) dry-cutting technology. The scCO2 acts as a vehicle to deliver dry and enhanced lubrication to a cutting zone. Developed by Fusion Coolant Systems, the process can machine parts without oils, emulsions, or synthetics. When carbon dioxide is pressurized above 74 bar (1,070psi) and 31°C, it becomes a supercritical fluid, scCO2. In this state, it fills a container like a gas, but with a density similar to a liquid. When delivered to the cutting zone, scCO2 expands to form dry ice, though it does not create a cryogenic substance like liquid nitrogen. The result is an effective coolant that often outperforms existing systems that incorporate high-pressure water/oil, minimum-quantity lubrication (MQL), liquid CO2, or liquid nitrogen. For knee implants, the most common workpiece material is titanium, with cobalt-chrome alloy use on the increase. Another nontraditional manufacturing technology being applied more often in orthopedic device production is 3D printing. The process uses titanium and cobalt-chromium alloy powders to produce complex, near-net-shape parts. In the medical industry, selective laser melting (SLM) melts the powders to build components layer by layer. The process allows medical manufacturers to generate special part contours and dimensions custom- tailored to individual patients. The process also produces consistent micro-pore surfaces that expedite bonding between the part and living bone. For finish machining, 3D-printed parts maintain most of their metals’ machining characteristics. However, some parts may need post-printing treatments to relieve uneven stresses generated during processing. In addition, for post-machining, fixturing can sometimes be a challenge due to the parts’ near-net shapes and complex contours. Seco engineers developed a standardized range of end mills for machining orthopedic components, converting specialized tooling solutions into a more flexible, standardized range. The metal alloy components of orthopedic implants, such as knees and hips, must possess excellent surface finishes to minimize wear of plastic parts and permit the joint to function for its projected lifetime of 20 years or more. In a knee replacement, the femoral component and tibial tray must be perfectly smooth to protect the plastic bearing insert against wear. Accordingly, the manufacture of orthopedic components typically requires grinding operations follow the milling process to achieve sufficiently smooth surfaces. However, grinding is time consuming and impacts overall manufacturing efficiency and flexibility. Equally critical, grinding generates high temperatures and stress in components, leading to dimensional errors that can affect the product’s strength and performance. Grinding can be supported – or in some cases replaced – with the application of advanced cutting tools and high-speed milling strategies. The goal of milling is to achieve a burr-free outside profile and a superior surface finish that delivers the exact required surface quality, integrity, and dimensional accuracy. If post-treatment is required, such as polishing, the time for that task can be minimized because of the defined surface roughness and structure achieved in milling. 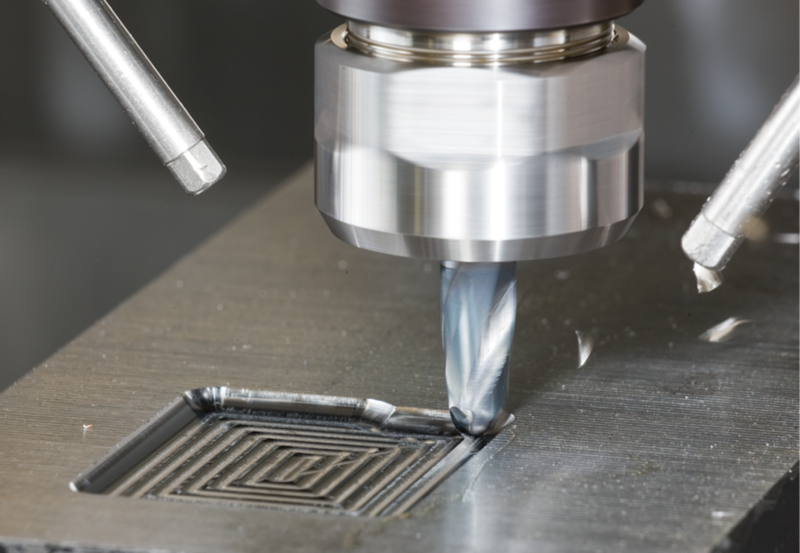 With high-speed milling, tooling should meet the parallel goals of long, reliable life with maximum productivity. The Jabro-HFM range covers 1mm to 16mm cutting diameters for small workpieces. In a representative application, a cast cobalt-chrome femoral component was finished using a ballnose end mill on a 5-axis milling machine. High-speed copy milling strategies and high-performance end mills eliminated a grinding operation, reducing part cycle time 50% to 11 minutes per part compared with the prior method. The change from grinding to milling of the condyle surface reduced scrap parts. The solid-carbide end mills made from a high-grade carbide micro-grain substrate offered superior toughness compared to standard carbide grades. In addition, a patented high-abrasion-resistant coating maximized tool life. The tools were engineered to provide high metal removal rates and smooth cutting action for superior finishes and minimized polishing time. The complex contours of orthopedic components often require specific sequences of specialized tools. The tibial tray, for example, can require up to seven separate machining operations including roughing, tray base roughing, tray base finishing, chamfer milling, T-slot undercut machining, wall finishing/chamfering, and undercut deburring. The challenge is to achieve superior surface finishes with minimal manual intervention as well as reliable tool performance with the best combination of productivity, cost, and quality. Traditionally, performing these multiple operations dictated separate special tools to produce each required contour, dimension, and surface finish. Special tools require design and development time and expense, and due to their low production volume, may have extended lead times and availability constraints. A new approach involves developing standardized tools with flexibility that enables them to be used in a variety of similar orthopedic parts. Global demographic and economic trends strongly indicate that demand for sophisticated orthopedic components will grow. At the same time, consumer desires and the determination of medical parts manufacturers to differentiate themselves from competitors are promoting development of personalized orthopedic components. Surprisingly, variable part specificity can be achieved with relatively new innovations and strategies that include dry coolant and 3D printing, along with advanced cutting and high-speed milling tools that are less specialized, more flexible, and more cost-efficient than the custom ones previously applied. About the Authors: Jan-Willem van Iperen (medical applications engineer) and Ruud Zanders (Jabro product manager) were part of the Seco development team. Engineers are available to help find best-fit standardized solutions in milling medical components and can be reached at 248.528.5451. Some design details of orthopedic devices differ greatly among manufacturers, but the products share many generic features simply because all human bodies are similar. Although manufacturers traditionally machine parts with custom tools, the wide and productive middle ground for tools that can efficiently machine the generic features in multiple materials meant generating a full suite of custom tools. Seco engineers analyzed medical component manufacturing processes and employed more than a decade of medical part machining experience to develop a more flexible, standardized range of end mills for machining cobalt chrome and titanium orthopedic components. The new range of tools have performance characteristics allowing them to be applied across a range of parts and materials. Tool standardization offers multiple benefits. Time is saved by eliminating the design, prototyping, and testing of custom tools. Because the tools are standard, they are also presented in Seco’s catalog and available around the world through the company’s distribution centers. Plus, the tools are produced in high volume to help lower their cost. This tool range includes nine geometries and 39 items, a selection expanded with different sizes, radii, and dimensions. Tools are engineered to produce features common to various orthopedic components, including knee and hip parts, bone plates, spinal parts, and others. Each of the nine geometries has a specific function or application such as roughing, finishing, T-slot undercutting, or production of fine finishes on complex, contoured parts. MicroBlasting alters the finish on a base material by adding texture and is used to enhance adhesion characteristics of a surface for improved bonding. Photo courtesy of Comco Inc.
Micro-abrasive blasting works at the micro-scale level so every part of the process impacts surface finish specifications. Precision sandblasting on a micro-scale – microblasting – suits small parts, delicate materials, and intricate geometries - such as those found in medical manufacturing. A mixture 17.5µm to 350.0µm abrasive and dry air travel at high velocity out of a 0.018" to 0.125" nozzle, producing a focused, controllable abrasive stream. Used to refine and perfect parts as small as a grain of rice to as large as a basketball, microblasting is versatile, precise, and controllable. Microblasting often alters the finish on a base material by adding texture. A micro-abrasive blaster can deliver texture to a sharp delineation (as precise as 0.007") and create a consistent finish to a specific Ra, often without the need for masking. What’s missing from your spec? (Left) Drug-eluting stent (200x): Peened dimples hold and slowly release a drug to block cell proliferation. (Right) Dental Implant (200x): Sharp jagged cuts create an interlocking surface that readily bonds to bone tissue. What should be included in a specification when using microblasting to get a textured surface finish? Most stop at abrasive type and blast pressure, but a list this bare risks inconsistent results. While drawing up a spec, focus on the desired result of the microblasting process, make it a measurable product output, then let the operator or job shop adjust variables to get the specified finish. Giving a contract manufacturer or job shop a defined target leads to a better understanding of the full scope of the project. Manufacturers can suggest an abrasive type and a blast pressure, but these two suggestions are just starting points and should remain flexible. Blast pressure is relative to each micro-abrasive blaster, and abrasives come in a range of consistencies depending on the provider. A part’s surface could need sharp grooves or soft dents. The shape of the abrasive particle and the composition of the targeted surface are the primary variables that determine look. Particle shape can be grit or bead. Grit abrasives have a sharp, angular profile and produce a matte finish on brittle and ductile base materials. Bead abrasives are spherical and produce a dented or peened finish on ductile materials. Bead abrasives leave a matte finish on brittle materials due to their fracture mechanics and the way brittle materials erode. To create a permanent, strong, and tight bond between a part’s surface and another surface, a matte finish provided by a grit abrasive, such as aluminum oxide or silicon carbide, is ideal. To create a temporary bond, soft dents created by round, soft media such as glass or ceramic are the best choices. 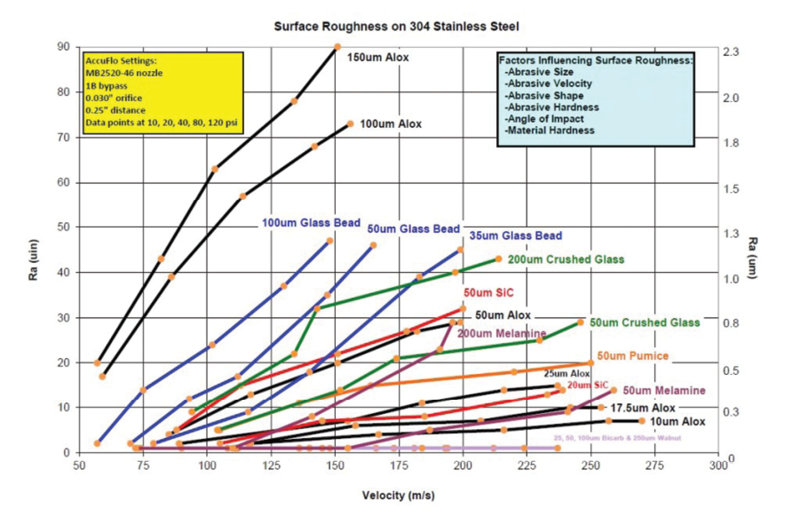 Different abrasives and their impact on surface roughness. 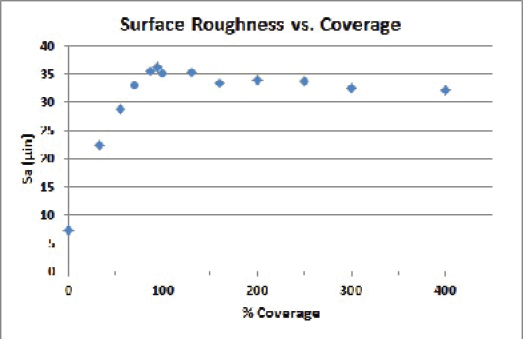 Surface roughness (Sa) vs. percent coverage for 100µm glass bead. The chart illustrates roughness stabilization once 100% coverage is achieved. The specification should cover a combination of amplitude and quantity of features to get consistent, repeatable results. 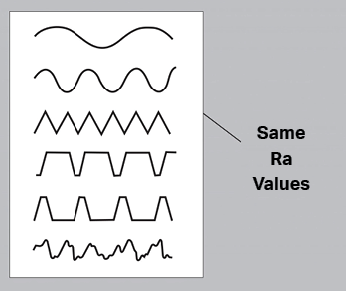 The best measure for amplitude is Ra (2-dimensional) or Sa (3-dimensional). Both express the size of the peaks and valleys created by micro-abrasive blasting. Ra is measured as a line and Sa is measured as a plane. Three variables impact Ra and Sa: abrasive size, abrasive type, and velocity. Abrasive size and type are inputs to the microblasting system. Velocity is driven by the long list of variables under “what’s missing?” Velocity has a linear relationship to Ra value: as velocity increases, so does Ra in a predictable and corresponding trajectory. Different surface profiles have the same roughness value, so Ra or Sa measurements are limited. They do not measure density or spacing, two variables that matter in texturing. Including Sdr (developed surface ratio), or the quantity of features in a spec, provides a greater understanding of the part’s surface properties and guarantees a more consistent, repeatable finish. Sdr expresses the amount of additional surface created by the blasting process. Measuring Sdr requires more sophisticated analysis systems with benefits down the line. Comco engineers rely on the Zygo optical profilometer for these measurements. It is vital to understand how a part’s base material reacts to an abrasive. On brittle materials, surface roughness is generated by using abrasive to take surface material away; while the opposite is true on ductile materials. When an abrasive particle strikes a ductile base it forges a crater on impact and causes a ring of raised material to form around the crater. So, surface texturing does not reduce the overall dimension of a part surface; it may even increase it slightly. The closer the part surface is to 100% coverage, the higher the Ra and the developed surface – maximizing the opportunities for interaction between bonding surfaces. 100% coverage indicates that the entire surface has been altered, that the peaks on the part surface are all connected with no untouched plateaus. Part makers can measure coverage informally by holding the part up to a light. Reflective surfaces at 100% coverage scatter light uniformly; while a line of light passes across a surface with coverage less than 100%. A profilometer can also analyze coverage by measuring Sdr and exposing flat regions on a textured surface. Roughness measurements, be it Ra or Sa, become stable at 100% coverage. Anything less, and measurements can vary significantly. Ra and Sa measurements are not useful without 100% coverage. Each of these surfaces have the same Ra. A Zygo optical profilometer is used in Comco’s applications lab. Why ask for specific results? Focusing specifications to a look, an Ra, Sa, and/or Sdr value, and 100% coverage requires more investment upfront but reduces output variance. Even if users simply want to turn a shiny finish to a matte or frost clear glass, specifying a desired result sets a pattern for creating consistent and repeatable surface finishes. Setting markers lays a solid foundation early, which eases growth should output need to increase. In most cases, surface texture is needed to promote adhesion or achieve a specific performance level. Parts that fall into this category must meet strict standards. These parts benefit from the results-oriented approach because it is measurable, repeatable, and easy-to-remember. About the author: Colin Weightman is director of technology at Comco Inc. He can be reached at 818.841.5500 or colinw@comcoinc.com. 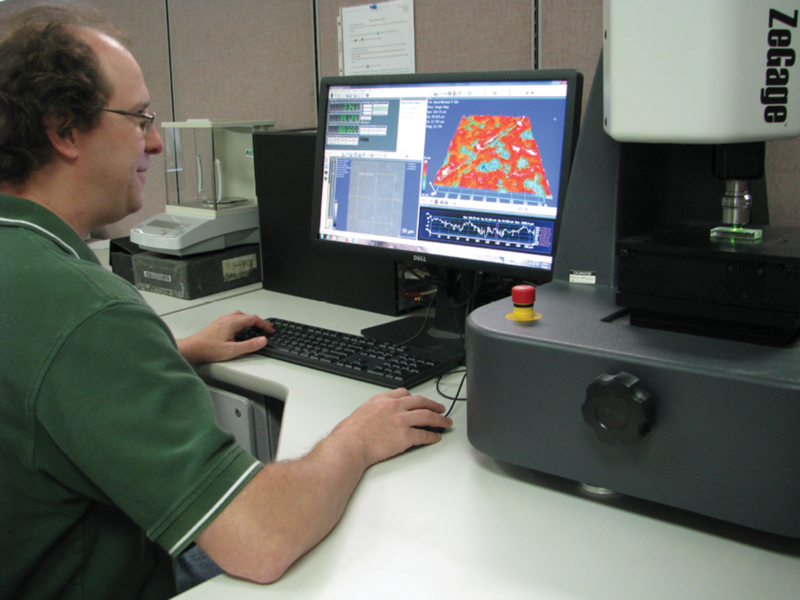 Learn more about microblasting and surface texture at www.comcoinc.com/surface-texturing. Gain a greater understanding of the types of media used in microblasting by reviewing the Abrasive Media Guide at www.comcoinc.com/abrasives. Continuous, contact-free vitals sensing and analytics help tackle failure-to-rescue challenges faced by U.S. hospitals. Hill-Rom, a global provider of medical technologies and the world's leading hospital bed manufacturer, today announced that EarlySense, the market leader in contact-free continuous monitoring solutions across the care continuum, has integrated its continuous contact-free heart rate and respiratory rate sensing and analytics technology into Hill-Rom's Centrella Smart+ bed platform. The Centrella bed, which offers optimized patient safety, enhanced patient satisfaction and advanced caregiver-focused technology, now allows for continuous monitoring of patients' heart and respiratory rates over 100 times per minute without ever touching the patient. EarlySense technology alerts clinicians to potential patient deterioration events much earlier than traditional monitoring methods, enabling health teams to intervene and avoid "failure to rescue" scenarios more effectively. Specific improved clinical outcomes demonstrated with this technology include helping reduce mortality related to "code blue" events by 83%1, and cardiac arrests by 86%.2 In addition, clinicians reported overall hospital length-of-stay was reduced by 9%2, and ICU days by 45%.2 Several EarlySense customers have reported that the system also assisted with early detection of sepsis, a condition that, when not identified and treated rapidly, may be life-threatening. "Hill-Rom's Centrella bed is transforming inpatient care by integrating advanced sensing and analytics into the bed, offering a complete patient safety platform to assist clinicians in providing the highest level of care," notes John Groetelaars, president and CEO of Hill-Rom. "EarlySense has been used to effectively monitor close to a million patients, positively affecting patient outcomes. By integrating the EarlySense technology into our Centrella beds, we are ushering in a new era in quality of care, whereby all patients can be continuously monitored throughout their entire hospital stay." "No patient should deteriorate without prior warning in the hospital environment. Continuous vital signs measurement should be the standard of clinical practice in the United States," says Dr. Frank Overdyk, a Charleston, SC-based anesthesiologist and expert on respiratory compromise. 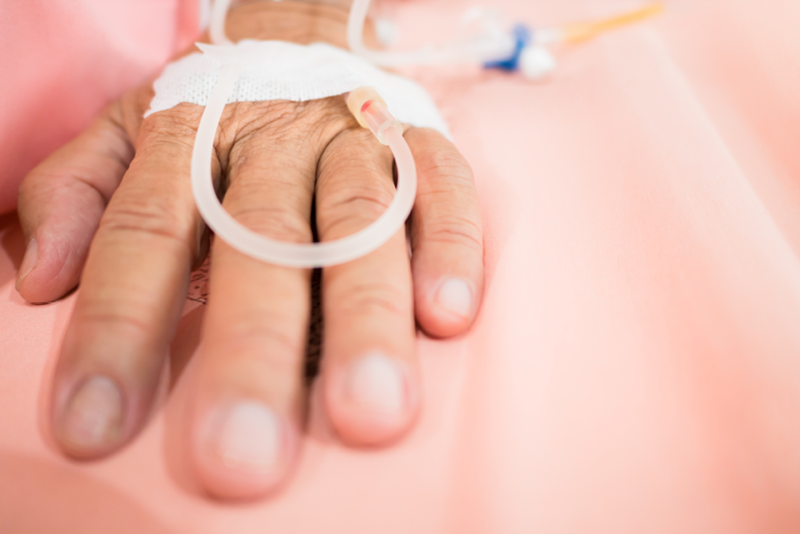 "Events such as opioid-induced respiratory depression and loss of life from failure-to-rescue are no longer acceptable given the availability of continuous vital signs monitoring." "We are proud to be Hill-Rom's exclusive bed integration and nurse call communication partner, making our sensing and analytics technology available for more hospital patients and ensuring timely, effective clinical intervention is achieved," notes Avner Halperin, co-founder and CEO of EarlySense. "Integrating EarlySense monitoring capabilities with the Hill-Rom Centrella bed platform will advance our collective aspiration of having every patient in every hospital continuously monitored for safe, data-driven care, with the potential to save thousands of lives and significant costs for the healthcare system." White MD, "Early Detection of Patient Deterioration Using Novel Monitoring System," results presented in ASCIP Conference, 2015. The American Journal of Medicine. March 2014, Volume 127, Issue 3, Pages 226–232.